On Friday, I walked down to the Botanic Gardens below the building and I noticed a new functional sculpture. I would definitely keep out some wildlife from your vegetables though it may make weeding and harvesting a little difficult. I don't think it was protecting anything but looked pretty cool. 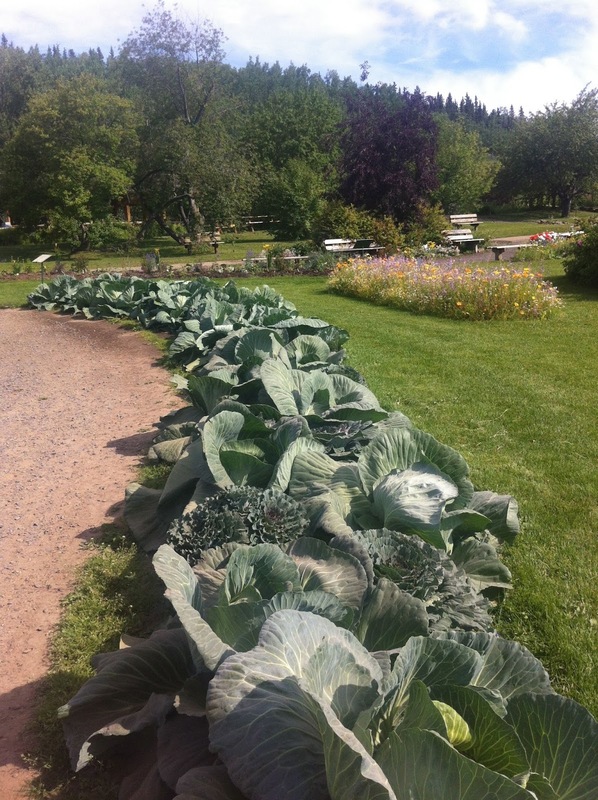 The giant cabbages look like they're doing well in spite of the lack of rain. I think that the mostly volunteer crew at the gardens do a phenomenal job keeping the place up and running. And they give the residents a hint at what grows well in this climate. I was there for our annual, departmental barbecue. The plan was to have it close so folks could simply walk down the hill. The fair is in town for the week and we picked up season passes so we could come and go anytime this week. 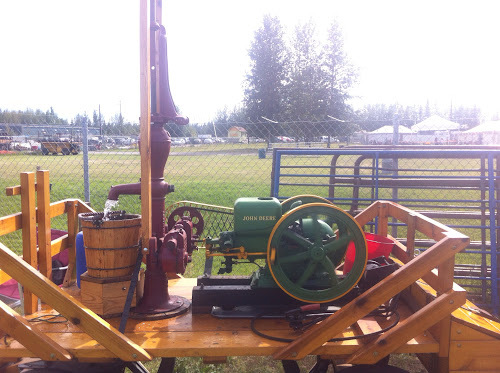 In Alaska, all of the regional fairs have the title "State Fair" so this would be similar to a county fair anywhere else. When we arrived this afternoon, it was surprisingly uncrowded (though that didn't last long). There was an antique tractor pulling contest though the weight transfer sled was sitting idle. They were just towing a trailer full of hay bales. Pictured is a small one engine running at only about 100 rpm powering a hand pump. 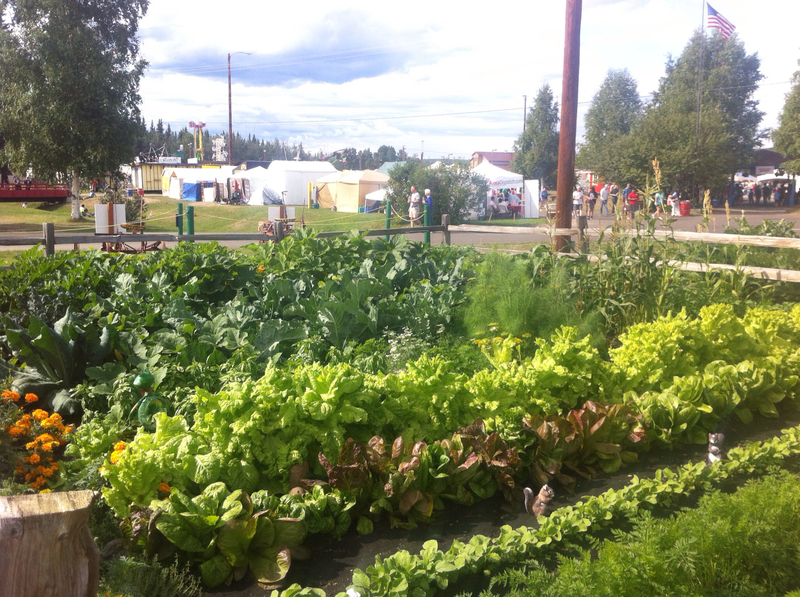 There was a nice display showing what your Alaska garden should look like. Any garden I've ever had anything to do with never looked like this. There was the usual mix of carnival rides, "as seen on TV" vendors and fair food. I was searching for something good for dinner but didn't find anything that really "spoke" to me. I ended up having leftovers at home. We went for a sidecar ride after dinner to look for a couple of geocaches. Bridget is trying to log at least one find per day for the month of August. This was also the first passenger test of the newly installed sidecar spring and shock. At first, the rig really pulled to the right so at the first stop, I added one click on the spring preload. With that change, handling was neutral. I'm told that the ride was improved. We tried using the Sena SMH10's again but the battery died on Bridget's unit after about five minutes. I think it was left on after it's last use. George Rahn, the local motorcycle guru, took a look at the new shock and spring setup, bounced on it a couple of times and commented that it was a whole lot better than stock. Plus, he liked the chrome plating. He is the one that recommended swapping the spring and shock out with one from an airhead as he had done the same thing with his Cozy sidecar. 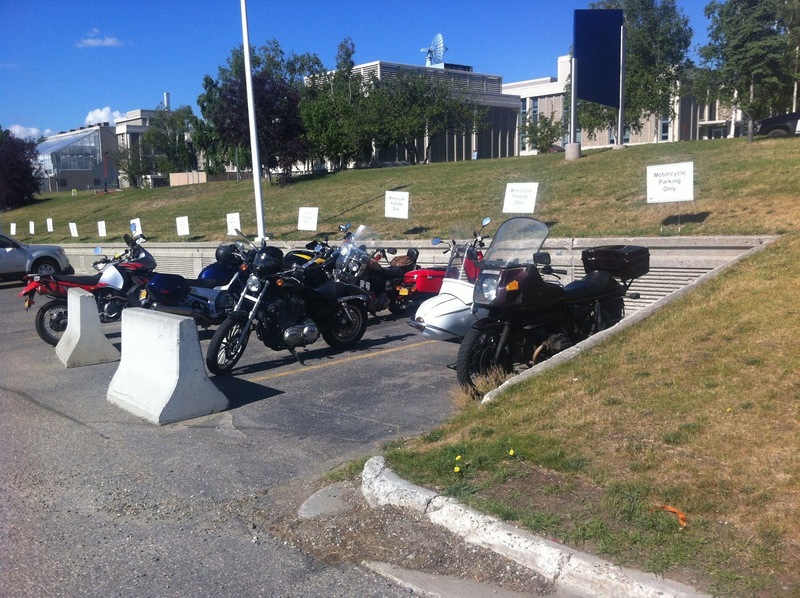 Here is a quick shot showing our beautiful weather and the crowded motorcycle parking. Maybe because of the short summer but gardening seems to be a big deal in Alaska. Some friends start planning and ordering seeds in the middle of winter and have developed all sorts or methods to get things started early. Later on this week at the fair is the competition of giant cabbages. The winner is usually something on the order of 70 lbs. One cabbage is usually good for about six gallons of sauerkraut. I used to make it on a regular basis though not lately. Such a good looking garden! And yes, that bike sculpture (recycling) would be a real pain in short order. There are some really nice gardens around here and all of the greenhouses do a booming business. One uses geothermal to heat/cool and power their greenhouses and produce year around. I thought the bicycle sculpture looked interesting. Maybe a place to keep your chickens safe from the hawks. So glad you are getting some warm sunny weather. I think your weather is better than back east right now. Less rain anyway. Those garden samples really are something. Somehow I don't think ours would look as good. 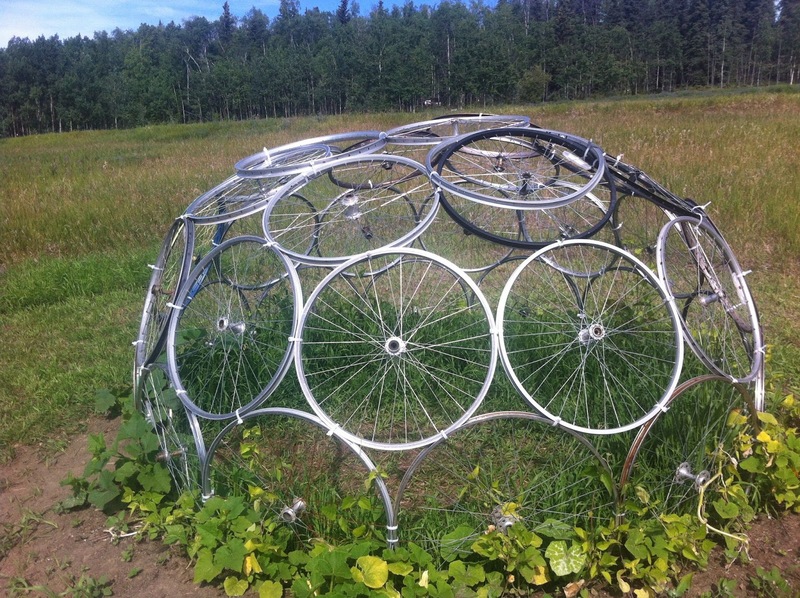 I really like the bicycle wheel art. Very cool. And we tried our moostard. Tasty, the lager one was quite strong but they are both very good. Thank you again. Perfect weather right now. Cool mornings and warm afternoons with still about 20 hours of daylight. THe botanical gardens have a huge volunteer staff looking after the place. It is the origin of the University of Alaska back at the turn of the century. Glad you like the Moosetard, they seem to have over a dozen varieties some much stronger than others. No bear guards. The picture presented quite blows away the tundra stereotype. I must drive to Alaska one day. its firmly on the list. No bear gaurds, no tundra, no clouds of mosquitos. Most people enjoy visiting here in the summer but may not want to deal with our other seasons. So RichardM, you adjusted the preload and it became neutral steering....how about when there's no passenger? Do you have to adjust it back? Good to hear that George gave the new shock a thumbs up. Yep, need to adjust back or else there is too much lean out. Fortunately, it's easy to adjust and there are four preload settings. Getting pretty used to the change in handling. I think we have a reasonable growing season due to the extra hours of sunlight. Maybe too much time in Montreal at the giant orange drive-in. Or just that a bicycle wheel kind of looks like an orange sliced crosswise. Richard, an Alaska cruise leaving from Vancouver is definitely on our travel wishlist. If I get tempted to ride there, I'll re-read Dom's travellogue until the feeling passes. It's actually a very nice ride up, I made the round trip last year with my thirty year old bike. No problems at all. Dom was a bit early in the season. Next summer, I'm thinking about riding down to the midwest followed by the west coast and back though it will probably be without the sidecar as it really impacts the gas mileage.